Next spring the flood of Mahler releases and re-releases is joined by a new symphony cycle from the Royal Concertgebouw Orchestra. I am sure the Concertgebouw has done its own market research, but my own survey reveals that the cheapest price on Amazon UK for an 11 CD Maher symphony cycle is £16.99 for Gary Bertini's well reviewed interpretations on EMI. Has it occured to anyone else that the death of classical music may in fact be a case of assisted suicide? * Header image features my original 1972 vinyl release of Georg Solti conducting Mahler's Sympony No 8 as the sleeve design of the new Concertgebouw cycle is simply too ghastly to feature here. 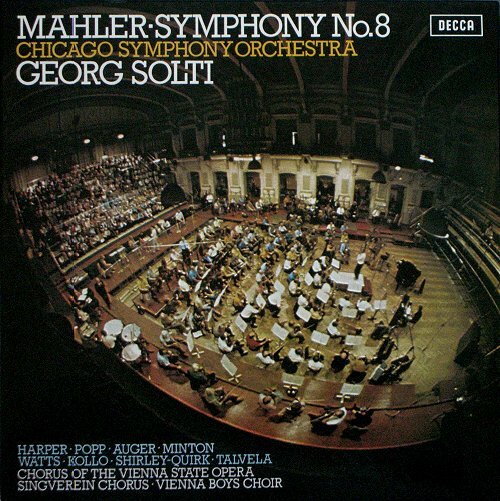 Solti's definitive Mahler 8 is, incidentally, currently selling for £5.24. Would Tom Service please note that one of the Royal Concergebouw Orchestra's two main sponsors is ING Group, the largest banking/financial services & insurance conglomerate in the world. The other main sponsor is Unilever which has attracted a variety of criticisms for its activities from political, environmental and human rights activists. While I understand your point, may I disagree. Styles evolves and modern audiences like to hear recordings made by artists whom they have heard live. They also like to hear their local ensembles as well, so recording has moved from a few happy few big international names allowed to record to a large number of smaller players. If the RCO releases a series of live performances done live (ie without a lot of costly post-engineering ...), then breaking even on them can be simpler than in Solti days. Were these will endure the same legacy of the Solti Mahler 8 is another story. Fair point Antoine. But it still leaves the suicidally low pricing on Mahler back catalogue. This influences the price expectation of buyers and reduces the perceived value of new releases such as the Concertgebouw cycle. Which squeezes margins and accelerates the vicious downward spiral which classical music currently finds itself in. Ghastly? So.. I thought, gee, I mean, how bad can it be, some goofy mug-shot or adobe render of the composer or something down home and comfy out of context or what, how bad can an album cover be? Did I get a surprise! What were they thinking?! I would love to have been in on that marketing meeting. "You want broken what?!" Re: Bertini, EMI do seem to be going into price meltdown at the moment. There’s complete collections of Du Pre, Gilels, Richter, Lipatti, Milstein and many other for less than £20 each, some less than £10. (unfortunately, the one I really want, the complete EMI Rostropovich, is still a relatively lofty £60!) It’s great for those like me who don’t have a lot of money to splash around, but this has the feeling of last-chance-to-buy. But EMI is just the most extreme example of this price madness – DG and Decca are doing the same with their older recordings, albeit at a slightly higher price. But I’ve seen the Philips Brendel Beethoven Sonatas recently for less than £30. When I started buying classical CDs about 10 years ago as an even more cash strapped teenager, that set was more than £100. So I feel that if we want this stuff on CD, we’d better all buy it now because surely it’s going to become unviable for the big labels very soon. Thanks Andrew, my point precisely.